This guide is for service providers who work with newcomer families who have children aged zero to six. It will help service providers understand the special needs of families that are new to Canada. The resource includes programming suggestions to address these needs. The information in this guide will be useful to a range of service providers, including public health nurses, home visitors, parent-child drop-in facilitators, childcare staff, primary health care providers and kindergarten teachers. To share research information on the needs of young newcomer children and their parents. To help service providers support the cultural identity of the children in their care. 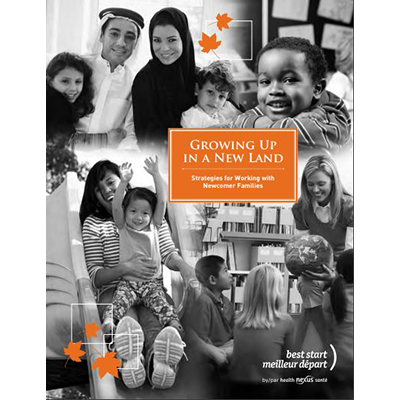 To help service providers familiarize newcomer families with Ontario practices related to early childhood development. To help newcomer families meet their children’s developmental needs. To help strengthen programming so that it is more culturally competent.